As a teacher, there are certain things I think I do well, and other areas where I think I can improve. One of these areas is helping students make connections between topics - especially at the end of a unit. Can I get students to see the proverbial "Big Picture"? For a recent unit on organic chemistry for my IB students, I tried something new. I gave them a handout with a list of organic compounds (by class/functional group) and a list of mechanisms and reaction types. Their task (in small groups), using either butcher paper or a large whiteboard, was to create a flow chart of reaction pathways. They had to find connections between as many different compounds as possible. I didn't provide much more guidance, but I encouraged the students to discuss their ideas together and consult their notes. Below is a picture of one of the whiteboards created by a group (used with their permission). Once everybody was done, we continued our work on synthetic routes by going through a few more practice problems. 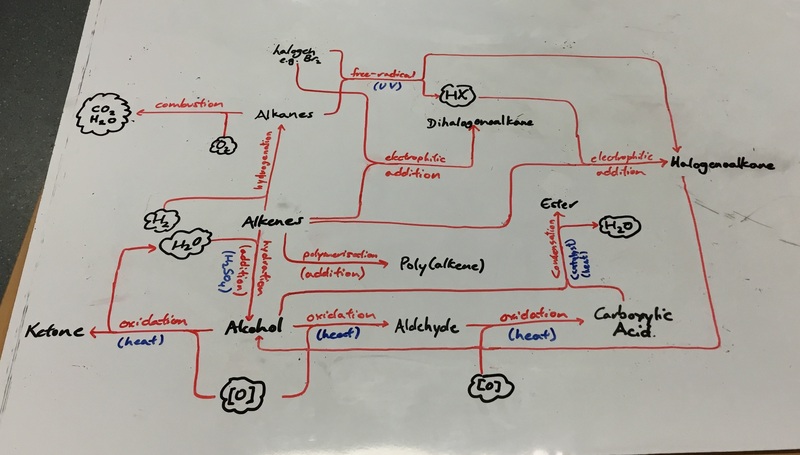 I don't have quantitative data to support my claim here, but I'm convinced that the creation of the flow chart helped the students see connections between the different types of organic compounds and solidified their understanding of the reaction pathways being studied. In terms of the compounds and mechanisms chosen, I restricted this list to meet the requirements of the IB syllabus for both SL and HL organic chemistry. 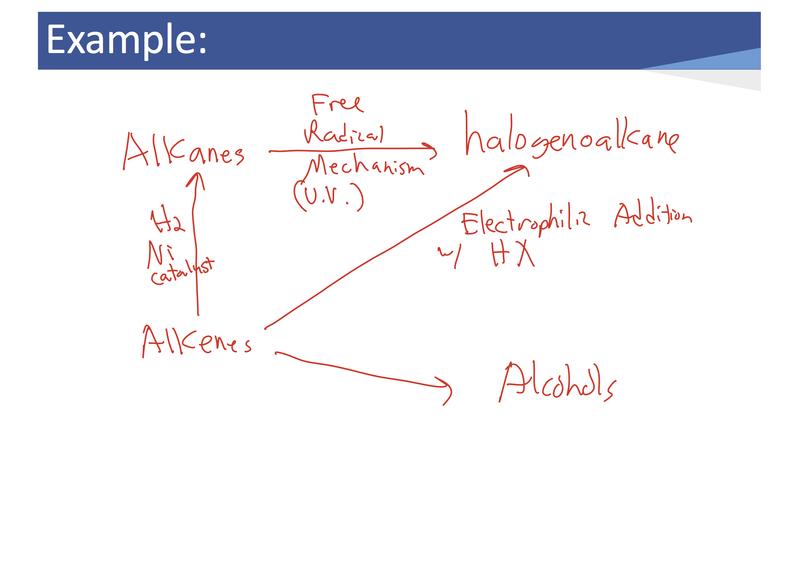 There are clearly many more branches to the reaction pathways that were not included. But it would be easy enough to modify the list to meet the needs of your own curriculum. This is certainly an activity I will repeat with future classes. If you are logged in to your ChemEd X account, you can download the handout I provide my students. I would be curious to know how you wrap up your units to help students see connections? The specifics will depend on your curriculum. The list I used was based on the current IB Syllabus. Students form groups with a large piece of butcher paper or a large whiteboard and some markers. They then create a flow chart of reaction pathways using the lists provided on the handout. I encourage you to walk around and offer feedback and ask questions along the way to help the students in the process. I found a quick discussion of the format with an example to be very helpful. The picture below shows the example I used (created using Notability on my iPad, with the .pdf file generated with PowerPoint). I'm not sure where the idea came from. I recall seeing the "official" reaction flow chart from the IB in their syllabus a few years ago and wanting my students to create the reaction pathways on their own as an activity.